and Equip 10's of millions of children and people in need all around the world! Please help Us By Making a Donation of ANY Amount. 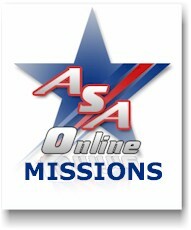 100% of all donations go to ASA Missions and our mission partners. Click Here to view our Crowd Funding Campaign! ASA is proud to be a supporter of Kids Against Hunger as a part of ASA Missions. 10% of our profit goes toward our mission partners. ASA is proud to be a supporter of O.U.R as a part of ASA Missions. ASA is proud to be a supporter of Khan Academy as a part of ASA Missions. ASA is proud to be a supporter of Kanzius Cancer Research as a part of ASA Missions. ASA is proud to be a supporter of Center For Relationship Education and W.A.I.T Training as a part of ASA Missions. ASA is proud to be a supporter of Charity Water as a part of ASA Missions. ASA is proud to be a supporter of The Blossom Care Network as a part of ASA Missions.